FRONT ROYAL, VA — In January 2009, two newly-elected Republican governors took the oath of office. Immediately, New Jersey Governor Chris Christie and Virginia Governor Robert McDonnell were touted as two of the GOP's hottest future presidential prospects. Today, they are fallen idols. The feds are investigating Christie. McDonnell and his wife have actually been indicted on federal charges ranging from conspiracy to "giving a false statement to a credit union." Yes, when he's trying to nail Al Capone, a federal prosecutor can review all of your tax returns, your college loan applications, and even your conversations with congressional staffers to find "inconsistencies" and "misstatements." So it's not hard to nail Al Capone these days. In The Tyranny of Good Intentions, Paul Craig Roberts, a senior Treasury official in the Reagan Administration, catalogues numerous instances of outrageous prosecutorial misconduct. "He is not an ugly, deformed brute. ...The tyrant is in fact quite clever, witty, usually handsome and affable, always eloquent." As icing on the cake, Boston lawyer Harvey Silvergate has written Three Felonies a Day, describing the nature and number of crimes that the average citizen commits daily without even knowing it. Given all that discretionary power, many Republicans are seething today at what they see as politicized prosecutors. After all, Obama's Director of National Intelligence, James Clapper, blatantly lied in testifying to Congress, and he isn't in jail. He hasn't even been fired. IRS official Lois Lerner, who shared confidential tax information with Obama's political cronies, pleaded the Fifth months ago, but she hasn't yet been indicted. The Attorney General only recently assigned a prominent Obama donor to "investigate" Ms. Lerner. Which brings us to Eric Holder himself, the poster boy of selective non-prosecution. Twenty years ago, when Holder was U.S. Attorney for the District of Columbia, Federal Judge Royce Lamberth referred to Holder's office the case of Ira Magaziner. The outraged Lamberth wanted Magaziner prosecuted for committing perjury in Lamberth's court. But Holder refused to prosecute Magaziner, leaving Magaziner free to continue working in the Clinton White House (he now works for the Clinton Foundation). The Crony Club prospers, and Holder has been using his office to protect them ever since. When criticized, he cries "racist!" 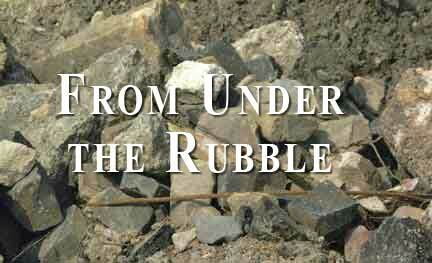 The Rubble recalls the title of a 1935 novel by Sinclair Lewis: It Can't Happen Here. In the Rubble's view, the most prophetic work of the genre that includes Brave New World and 1984 is Robert Hugh Benson's Lord of the World — a favorite of Pope Francis. All those authors knew their Aristotle. "Man, when perfected, is the best of animals, but, when separated from law and justice, he is the worst of all," Aristotle observed in his Politics. And when those in power are separated from law and justice, he adds, the result is tyranny. "He is not an ugly, deformed brute. Callicles is not repulsive, but sophisticated, a college man. Alcibiades is among the most charming of young Greeks. The tyrant is in fact quite clever, witty, usually handsome and affable, always eloquent." And yet, we wonder in bewilderment, "how can this happen here?" We might be loath to hear it, says Father Schall, but "the tyrant almost invariably arises out of a democracy. Democracy breeds tyrants." That might not sound so familiar. After all, America is a democracy, isn't it? It stands to reason that the budding tyrant will hide his lust for power over us. He longs for love, not justice. Democracy? Republic? Mixed regime? Who knows? Does Democracy Breed Ignorance, Too? For decades, colleges have drowned their students in slave narratives and fawning feminism. No time for studying history, literature, or philosophy. At George Mason University in 2009, an adjunct professor teaching the required American History course told her startled students, "You learned all this in high school, so we're going to talk about Obama. And so she did, for the entire semester. Meanwhile, the once-prestigious University of North Carolina now admits that over 200 of its courses in Afro-American Studies were "academically deficient." Which really means that the courses were "barely taught, if at all." Alas, those thousands of students (primarily athletes) who took those "courses" over the years were deprived of even the semblance of an education. Eternal vigilance is the price of liberty, right? Alas, too few have been vigilant. And that's why it can happen here. According to the PC crowd, the only tyrant around is the husband who keeps his wife trapped in the home raising their children. But Father Schall knows better. "A person under the influence of jealousy and envy kills." "The tyrant wants to be loved," he continues. "He craves public admiration. He arranges many public appearances. He wants people to tell him that he is nobly serving them." It stands to reason that the budding tyrant will hide his lust for power over us. He longs for love, not justice. Some conservatives are not immune to the tyrant's siren song. In fact, they can be among the most ardent defenders of a more powerful government — as long as they, their friends, or their party are in power. They fail to realize that, when it comes to dealing with the temptations and vices that arise in man's fallen nature, Americans are hardly "exceptional." Alas, as sinners, we are no different from anyone else. Many of Father Schall's students at Georgetown came to Washington in order to enter politics and to improve the world. Well, says the professor, Plato was no different. He used well-placed relatives and friends to enter the public life of Athens. "I thought they were going to lead the city out of the unjust life she had been living and establish her in the path of justice," Plato wrote in his Seventh Letter. Changing the world is easy, you see: one needs only good intentions. But when Plato was in his twenties — not much older than today's college students, Father Schall writes — "Socrates, the most just of men, was convicted… They put to death a man who refused to take part in civil injustice as if to say that there is no final justice in any existing city, even Athens." Perfect politics are beyond the reach of this world. "We have here no lasting city," (Hebrews 13:14), Father Schall writes. Even if it's ruled by Republicans. Obama has defied the law, perverted justice, and corrupted the government. Yet, amidst all the cronies and the glitz, he's miserable. At the end of the Republic, writes Father Schall, "we see that the tyrant, who uses everyone else for his own purposes, turns out to be, not the happiest of men, but the unhappiest. He can trust no one. Every relationship with him is tainted with fear or false adulation." He has sapped our national spirit, desecrated our laws, and divided our people. As Pope Francis pointed out last week, "the worm of jealousy and envy" is destructive. These vices "divide the community" and stir "the broth of bitterness." They are deadly: "A person under the influence of jealousy and envy kills," he said. Yes, Obama has stoked the deadly fires of jealousy and envy in the land. But no Christian can respond in kind.